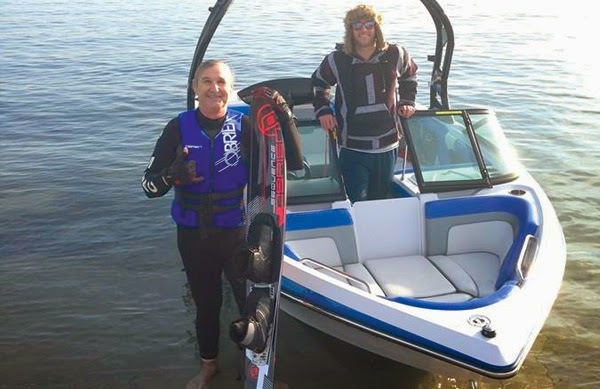 For the past eight years Scott Leason has been training at MBAC, twice a week, year-round to compete and qualify for the US Disabled Water Ski National Championships. In June, Scott accomplished his goal of qualifying for the national championship by bringing home gold in the regional qualifier. Twenty one years ago, Scott Leason was shot in the head during a robbery at a convenience store and blinded for the rest of his life. While most people might let this bring them down, Scott is grateful to be alive and actively living a life any adventure seeker craves. He has found solice in training where he not only improves his waterskiing and wakeboarding skills, but also a sense of purpose through competitive spirit. Every year, Scott attends the US Disabled Water Ski National Championships in hopes of a gold medal. The competitive event, put on by USA Waterski, provides opportunities for people with varying disabilities to compete on a national level. This year’s competition will be held August 29-31 in Talking Rock, Georgia. A few weeks ago, Scott competed at the Western Regional Disabled Water Skiing Tournament in Elk Grove, California where he claimed the gold medal. He’s hoping that this will be a prediction of what his results will be like at nationals. He has some tough competition at nationals, but is confident in his pursuit of a gold medal. We are all hoping this will be the year that all of his hard work pays off. To check out Scott’s adventurous and active lifestyle, check out his photos on his Facebook page, Never Lose Sight. You can also view a short documentary, True Vision, about his endeavors at vimeo.com/24253075. We are so proud of all that he has accomplished and will be cheering him on to bring home the gold at nationals!